Back in the 1970s there was concern about running out of oil. The first oil crisis had made the dependence of advanced economies on oil very clear, and there appeared to be only less than 40 years of reserves remaining, as measure by the reserves to production ratio. 40 years later there is now 50 years of oil remaining. And looking at estimates of the total available fossil fuels any prospects of shortage seem distant. What has become increasingly clear over that period we are running out of the ability of the atmosphere to absorb carbon dioxide far more quickly than we are running out of fossil fuels. Indeed, there is far more carbon in the ground than can safely be put into the atmosphere. This is shown on the chart below. The horizontal axis shows trillion tonnes of carbon dioxide. 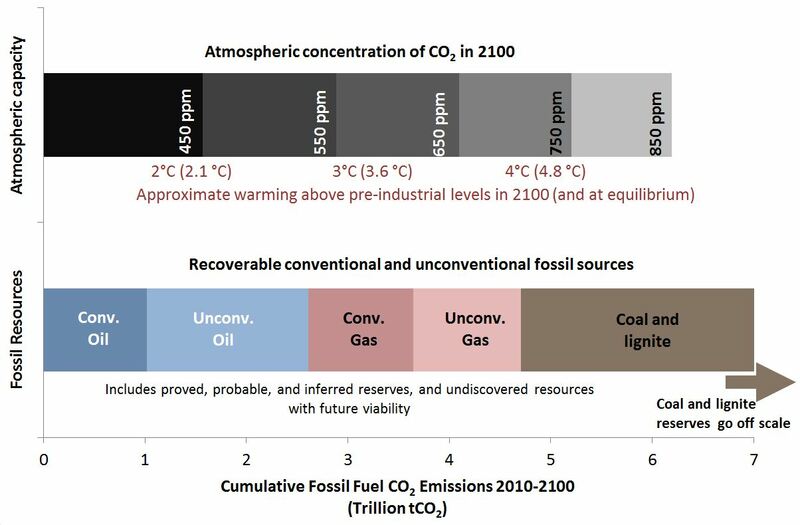 The lower bar shows estimates of how much carbon dioxide would be released by burning all of the world’s oil, gas and coal reserves still in the ground, assuming no CCS when they are burnt. The reserves include proved, probable and an estimate of those still to be discovered (so is an estimate of total carbon, not just currently proved reserves as are sometimes quoted). The upper bar shows the concentrations of CO2 (i.e. excluding other GHGs) in the atmosphere in 2100 associated with particular levels of cumulative of emissions. The expected temperature rise above pre-industrial levels for each concentration is also shown, both for 2100 and (in brackets) at equilibrium if that concentration were to persist indefinitely. The results are so clear cut that the broad conclusions are robust to any realistic uncertainties either around the amount of carbon in the ground (many of which would allow for greater fossil fuel reserves) or around the sensitivity of the climate to forcings (including those that have recently been widely discussed). Sources: IPCC SRES and RCP scenarios and ensemble model results; BP Statistical Review of World Energy 2012; EIA (2012); Rogner (1997)[ii]. Proved reserves are less, totalling a little less than 3 trillion tonnes of CO2, although this is a conservative estimate. There are two overarching implications from this. First, the scarcity of fossil fuel reserves is not going to constrain their use without policy intervention unless a very large proportion of these reserves is prohibitively expensive to extract, which is almost certainly not the case. Such is the scale of the excess that it seems extremely unlikely that prices will rise by enough to constrain cumulative emissions to anywhere near safe levels without policy intervention. Deploying CCS, thus allowing the reserves to be burnt without getting into the atmosphere is among the possible policy interventions, but it is unlikely to be deployed at anything like the scale that meets the challenge on its own. Second, because such a small proportion of the available reserves can be used, there will be a need to focus on using fossil fuels only to provide those services that have a particularly high value and that are especially difficult to provide by other means. And even these services will need to be provided as with the minimum intensity of emissions per unit of service. Considering what these applications may be raises a whole host of issues, and best use may not be signalled by a carbon price alone. It will also, of course, remain important to limit emissions from other sources, including industrial processes and land use, and emissions of other GHGs. Whatever policy routes are followed, it is clear that we cannot safely put into the atmosphere over a few tens of years more than a small fraction of the useful carbon that has been trapped in the ground over tens or hundreds of millions of years. All policy formulation must take place in this fundamental context. Notes on the chart. The horizontal axis is trillion tonnes of CO2 emissions. The lower bar shows estimates of the CO2 of emissions from burning fossil fuel reserves this century, based on standard conversion factors, and assuming no CCS. The total of CO2 emissions from burning all coal reserves (including lignite) goes off the scale by a large distance. Data sources for reserve estimates are shown on the chart and notes at the end. The upper bar shows atmospheric concentrations resulting from cumulative emissions this century totalling the number of tonnes of CO2 marked by the x-axis. Due to the long residence of CO2 in the atmosphere broadly the same arguments apply even if a longer time is allowed for burning the reserves. The temperatures are taken from the mid-range of the IPCC’s cases (SRES and RCP) taking the corresponding assumptions for other GHGs and forcings. As such they ignore major non-linear feedbacks at threshold concentrations (tipping points). The temperature rises are at 50% probability. For higher probabilities of staying below a given temperature – for example the Carbon Tracker report quotes 80% – the cumulative emissions would need to be lower. The estimates appear close to estimates published in Nature by Allen et al. [iii], who indicate that avoid a rise of 2 degrees centigrade it will be necessary to restrict emissions to 3670 GtCO2 between 1750-2500. Roughly half has already been emitted. That leaves 1800 GtCO2 still available, which is broadly in line with the number shown on the chart. Meinhausen et al. in the same edition of Nature gave a figure of 1440Gt by 2050 for a 50% probability of not exceeding two degrees in the 21st century, a somewhat higher estimate[iv]. The results are similar to the Carbon Tracker analysis for emissions to 2100, which shows budgets of 1.55 trillion tonnes for two degrees, and 3.30 trillion tonnes for three degrees (with 50% probabilities of limiting temperatures to threshold values)[v]. Some studies including the Carbon Tracker analysis, have presented a similar comparison, but looked at emissions to the period 2050, and quoted a correspondingly lower figure. Similar analysis of fossil fuel reserves presented by James Hansen can be found at http://www.plosone.org/article/info:doi%2F10.1371%2Fjournal.pone.0081648. Data is broadly similar (though in GtC not GtCO2, so there is a factor of 3.7 that needs to be included in the comparison). He shows conventional oil and gas reserves as about 15% and 25% lower respectively than shown here. Unconventional oil and gas reserves are 45% higher and 220% higher respectively. Total fossil fuel reserves excluding coal are correspondingly shown as 30% higher in Hansen’s analysis than here (6.3 GtCO2 vs. 4.7 GtCO2 shown here). These discrepancies are small relative to the uncertainties, and make almost no difference to conclusions. In addition Hansen allows for a very large tranche of unconventional gas (possibly clathrates, which are excluded from the total shown here), and like the analysis shown here includes very large coal reserves. [ii] Rogner, H.H. (1997) “An assessment of world hydrocarbon resources”, Annu. Rev. Energy Environ, 22:217–62.